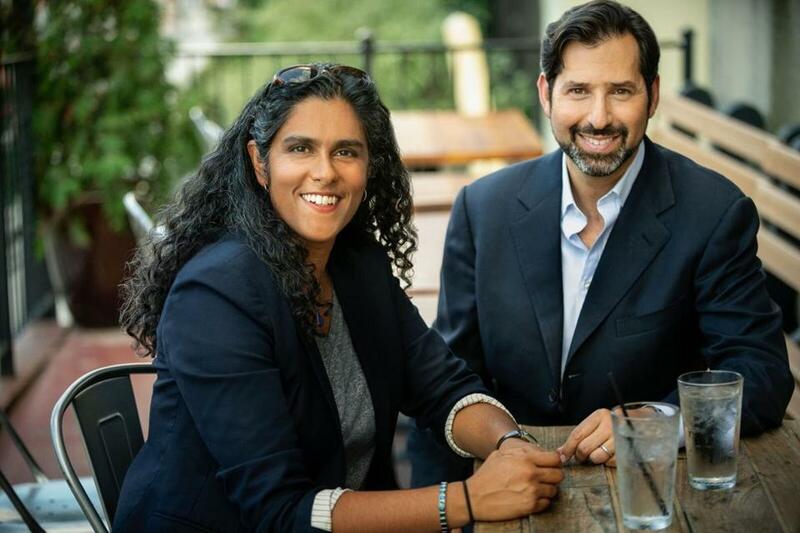 “On Point” hosts Meghna Chakrabarti and David Folkenflik. Last month, Meghna Chakrabarti and David Folkenflik took over as the permanent hosts of “On Point,” WBUR’s two-hour, live call-in show. They arrive after “On Point’s” longtime host, Tom Ashbrook, was put on leave in December and fired in February. Former employees had accused him of creating an abusive workplace environment at the Boston public radio station. The venerable “On Point” went nine months without a steady voice, and listeners began to tune out. The show has lost nearly 300,000 weekly listeners and 11 stations from spring 2017 to spring 2018, according to the latest figures from NPR. “On Point,” an innovator when it debuted in 2001, now competes with on-demand podcasts as well as “1A,” an upstart public-radio show in the same time slot. When Diane Rehm retired, NPR replaced her with a two-hour live show called “1A,” which is really taking off. Do you consider that show your biggest competitor? Chakrabarti: I don’t necessarily think about any other specific show. It’s the fragmentation of all media, the digital revolution that we’re all in. Even competition isn’t the right word. That’s our new ecosystem. A lot of the excitement and ingenuity in audio has shifted to on-demand podcasts. How do you keep live radio relevant in this age of podcasts? Folkenflik: They are not mutually exclusive. There’s a lot of excitement about the medium of audio, of which public radio and NPR and this program are core parts. You can do different things that bust up expectations and formats and lengths and sensibilities. I consume that. I also consume radio as radio. You’ll find that something like 20 to 25 percent of our weekly listenership listens to it digitally. Those are being primarily podcasted. Chakrabarti: My answer is in your question. It’s live. It will always be relevant because it’s live, especially given the news cycle that we’ve been in for the past two years. Every day there is something that happens that is worthy of deep, profound discussion, and we don’t have to wait until our podcast comes out three days later. How are you making “On Point” different? Folkenflik: I see this less as a question of being done in opposition to anything Tom did, but more a sense of what feels organic to each of us and the two of us together. I don’t want to wear somebody else’s clothes. I thought you would do the show together, but Meghna is on Monday through Thursday. David is on Friday — while also staying on as NPR’s media reporter. David, why did you keep that gig? Folkenflik: In this particular moment, the story of media is not a side dish but really a main course. It’s at center stage. I wasn’t prepared to relinquish that. In the wake of Ashbrook allegations, WBUR hired an outside firm to investigate the company culture. He’s gone, but much of the management stayed the same. Can the culture really change? Chakrabarti: WBUR is a place full of people who are so dedicated to our work and our mission. The sheer fact of that dedication gives me the total confidence that it’ll work out. Folkenflik: I’d be smart to just keep my mouth shut. Let me say two things, all right? The first is that I wouldn’t be here if I weren’t convinced that WBUR, its management, and this program are committed to the mission. Let’s be clear the issues raised at NPR, and WBUR for that matter, when placed alongside those at Fox News, at NBC, at CBS, look pretty modest. But they are real, and they affected the work environment experience and needed to be taken very seriously. Did you seek advice from Ashbrook? Have you heard from him? Chakrabarti: [Long pause.] Tom sent me a very nice e-mail. It was a gracious e-mail. Tom Ashbrook asks: Is there room for redemption? Shirley Leung is the interim editorial page editor of the Globe. She can be reached at shirley.leung@globe.com. Follow her on Twitter @leung.